Johnston’s Pond, named for the freshwater pond adjacent tothe beach, is the easternmost beach in the MDS. 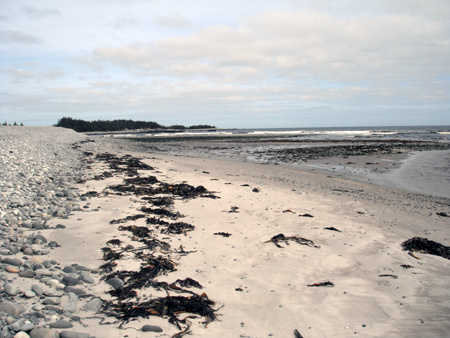 A small parking lot and access path are located on the Port l’Hebert end of the sand and cobble beach, which is popular with walkers, photographers, birders and surfers. At one time, a road behind the beach joined the communities of Little Port l’Hebert/East Sable River and Port l’Hebert, and for several decades, a deep channel separated the two sides. In recent years, the channel has closed in again, testament to the ever-changing dynamics of the beach. A large area of tidal flats, which was a popular place for clammers, is again covered with fresh water, while sand and a variety of dune vegetation covers another. The Nature Conservancy of Canada owns and manages extensive conservation lands around Johnston’s Pond, which is included in the Port Joli Sector of the South Shore Important Bird area and designated as critical habitat for Piping Plover. It is also home to nesting Spotted Sandpipers and Willets and overwintering waterfowl including the provincially endangered Harlequin duck.